Spring might just be the best season. Not only does it mean asparagus and strawberries (which taste oh so incredible after the endless winter months of practically nothing but beets and celery root), but it also means that there is hope in terms of the weather. Trees start to blossom, the days get longer and the weather finally starts to get warmer. It also means that it is time to drag out the old barbecue and get back to grilling. Having worked at a few restaurants over the years where barbecues are used as a primary method of cooking, I have come to appreciate what grilling can lend to the overall flavour and execution of a dish. I have also learned that with a little know-how, just about anything (fish, meat, vegetables or fruit) can be cooked over an open flame. My current go-to for grilling is sardines. They are quick and easy to cook, and their slightly oily and fishy flavour lends supremely well to a little char on the barbecue. Lately, I have been pairing them with lovely flowering broccolini I am finding at the market, which also take a turn on the grill to get a little colour. I love how well their naturally bitter flavour pairs with this fish. The nori sauce used as a dressing brings a necessary hint of acidity and balance to the dish. It is made using a mortar and pestle, which I appreciate as a tool because it saves me from dragging out (and then having to clean) a food processor. In turn, I then have more time to spend enjoying these deliciously grilled sardines. So here is a toast to barbecues, blossoms and all other things spring, for it can really only mean one thing: Summer is right around the corner! In a mortar and pestle, gently smash together the garlic and lime zest. Add the nori and sugar and continue to grind until a paste forms. Add the soy sauce and vinegar and mix and grind together. Stir in the oils. Allow to sit for 10-15 minutes (and up to one day) in the fridge before serving. Bring a small pot of well-salted water to a boil. Blanche the broccolini for 1-2 minutes, just so they begin to tenderize. Immediately remove them from the boiling water and run under cold water in order to stop the cooking process. Pat the sardines dry before seasoning to help prevent them sticking to the grill. Lightly oil the sardines and broccolini with olive oil and season with fleur de sel. Begin by grilling the sardines. Lay each fish on the grill, close the lid and allow to cook for 2 minutes. Using a metal spatula, carefully flip each fish. Allow to cook for an additional 2 minutes on the second side. Remove and lay the fish out on a large platter. Grill the broccolini, turning after a minute or so, or when you see it start to char. Be careful, as they tend to cook quite quickly. Remove and lay out across the top of the sardines. Lightly season the whole platter with fresh lemon juice. 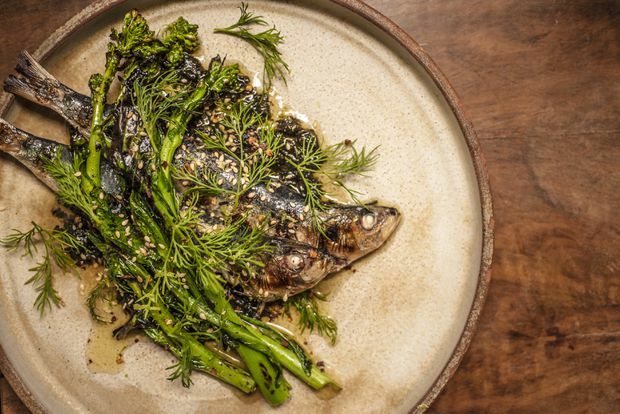 Spoon the nori sauce over the grilled fish and broccolini. Toss the arugula or mustard greens with lemon juice, olive oil and salt before garnishing the platter. Finish with sprigs of dill, toasted sesame seeds and chili flakes. Serve immediately.